If your makeup fantasy can’t take you any further than classic smokey and cat eye looks and glam red lips, then we want you to check out makeup artist Laura Jenkinson’s Instagram account, where you’ll indulge into your childhood memories and dreams! 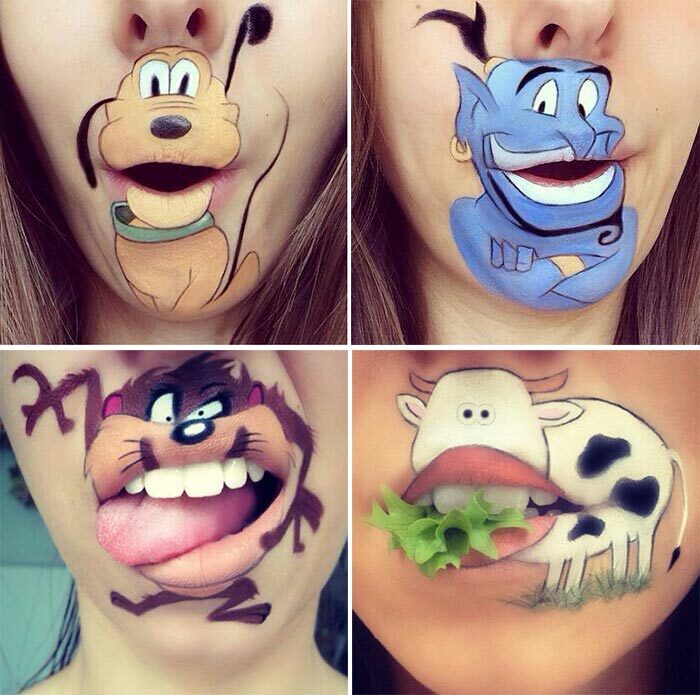 Laura Jenkinson uses her own lips as a canvas for picturing various popular Disney cartoon characters on her face, starting a real revolution in the makeup world. What makes the stories so captivating and thrilling is that she draws those images in such a way that her mouth is the mouth of a popular cartoon character, her teeth is its teeth and it’s all just so natural-looking and wow-worthy! 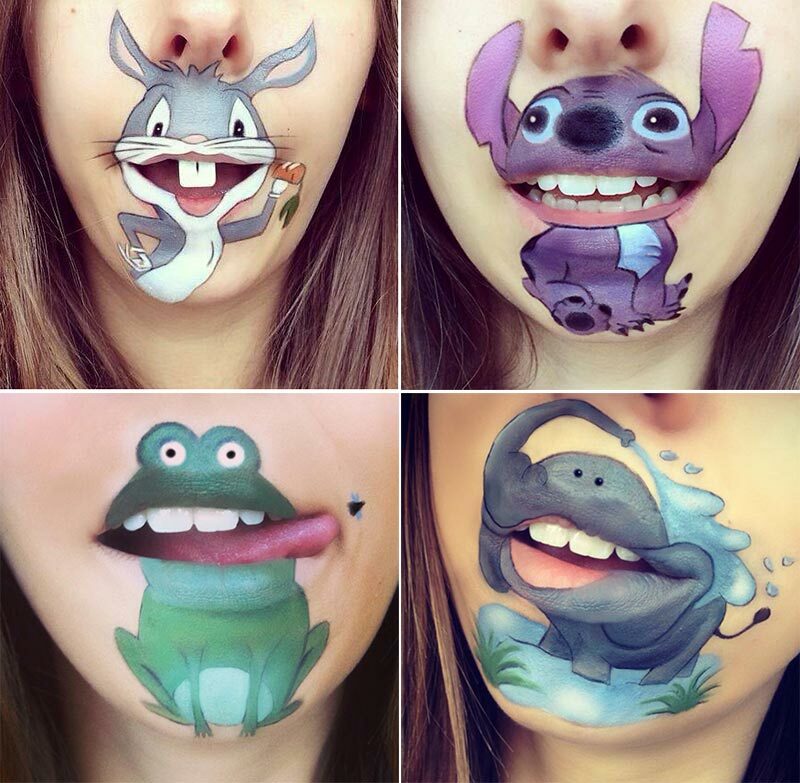 Laura Jenkinson is a 25-year-old UK-based makeup enthusiast and hair stylist, who has devoted her last year to this Disney inspired lip art project, creating the images of the Minions, Shrek, Aladdin, Bugs Bunny, Stitch and many other popular characters by request. 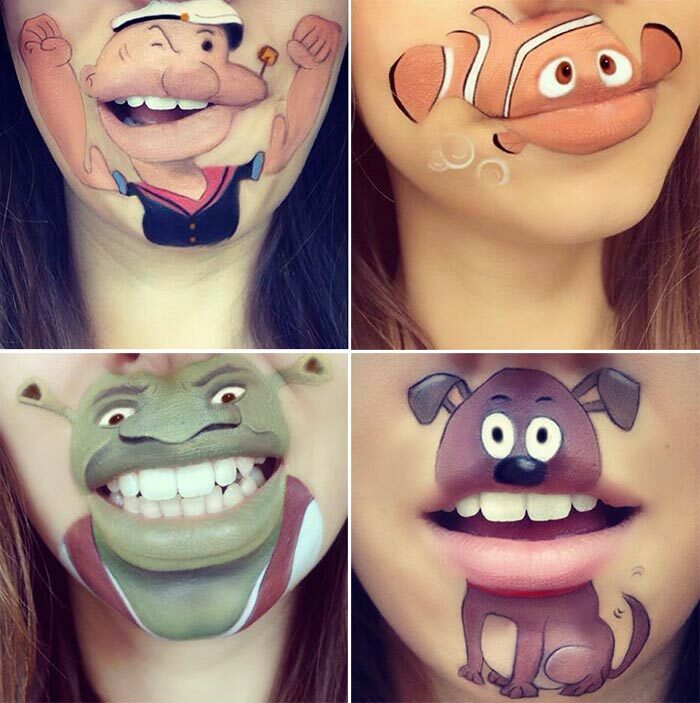 Besides this fairy-tale series of cartoon lip makeup looks, she also loves playing with spooky Halloween-ready makeup effects, doing it all really skillfully. Her exceptional theatrical illustrations and makeup talent have turned her into a real Internet sensation, as each of her Instagram images receives more than 1500 likes and she has got a huge army of followers on Facebook too. 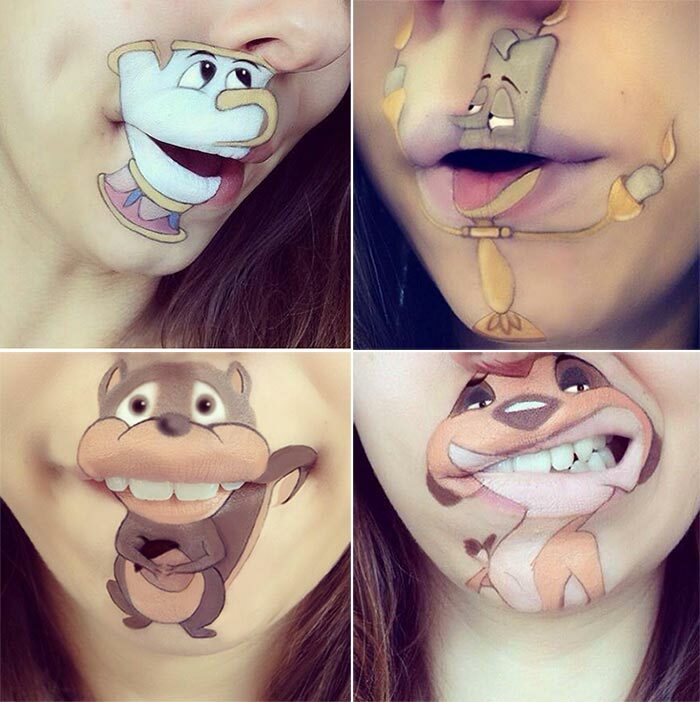 As a source of inspiration for creating these utterly adorable and exceptional cartoon lip makeup looks, Laura has turned to many other talented makeup artists on Instagram, trying to do something this cool on a bigger scale. 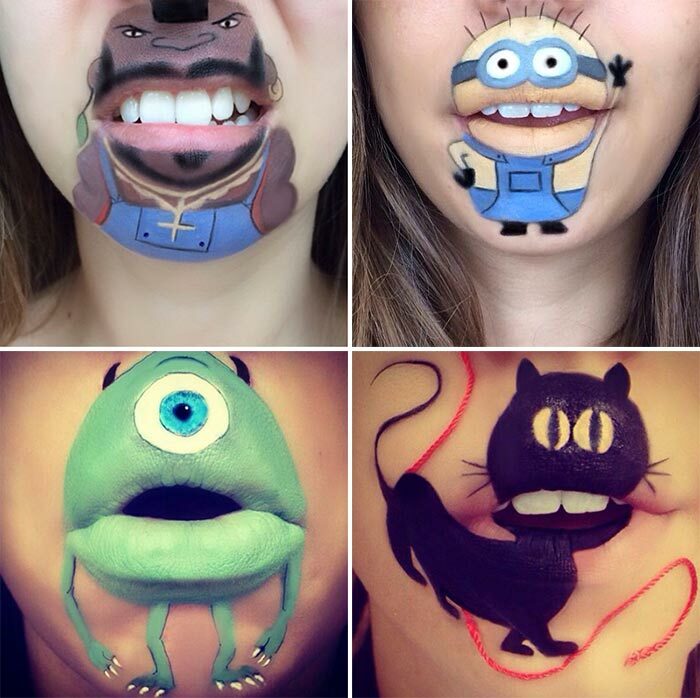 While these innovative lip makeup looks aren’t ideal for wearing on the daily basis, Laura Jenkinson’s cartoon lips will be quite wearable for special festivals, party nights and, of course, Halloween. Who said that you need to be only spooky on this special holiday, when you can instead arouse lots of admiration, laughter and good childhood memories among your friends tying to copy any of Laura’s lovely looks! And who knows, maybe Laura Jenkinson’s creative lip makeup looks can give a birth to a brand new crazy and unmatchable makeup trend in the beauty world!